AFC - 08/14/13 ZeGeVege Festival of Sustainable Living! 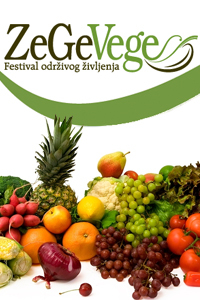 On Friday, September 6, 2013, at 9:00 A.M., the 6th ZeGeVege Festival of Sustainable Living will open! ZeGeVege Festival will take place as part of the international Veganmania project, which will finally come to Zagreb after taking place in Linz, Graz, Winterthur, Munich, Vienna, Klangenfurt, Iserlohn, and Innsbruck. Around 70 interesting local and international producers of health food, eco-products, and cosmetics that have not been tested on animals will be presented during the two days of ZeGeVege Festival, which will take place on Friday, September 6 (9:00 A.M. - 9:00 P.M.) and Saturday, September 7 (9:00 A.M. - 5:00 P.M.). Various musicians, dance groups, and performers who support sustainable lifestyle and animal rights and protection will perform during both days of ZeGeVege Festival, on the stage and all over Trg bana Jelacica, where the festival will be taking place. Restaurants with vegan offerings, free cosmetic and hair treatments, various tastings and promotional sales, cooking workshops, lectures, dance schools, a children's corner with a workshop for our youngest, screenings of short documentaries, a lottery, and various other events are a guarantee that this 6th ZeGeVege Festival will offer lots of entertainment to its visitors, who will be able to meet various exhibitors from Croatia and abroad at as many as 60 stalls and during 20 hours of music and performance programming on the main city square of Zagreb. This festival is unique in Croatia in that it promotes exclusively vegetal and environment-friendly products. It will be officially opened by Zagreb's mayor, Mr. Milan Bandic, and its sponsors include the Croatian president, Mr. Ivo Josipovic, the Ministry of Agriculture, City Office for Agriculture and Forestry, City Office for Health and Veterans, City Office for Energy, Environment and Sustainable Development, and the Zagreb Tourist Board. Last year's ZeGeVege festival counted more than 30 thousand visitors, 24 performers, and 60 exhibitors, and its excellent atmosphere is a sufficient recommendation for this year's visit. This international event is interesting, entertaining, and educational, which makes it an important element in promoting a sustainable lifestyle, which benefits humans, animals, and the environment alike. ZeGeVege festival is a non-profit event. Animal Friends likewise invites the representatives of mass media to support and promote ZeGeVege festival with their reports and media coverage.